Purchased this very nice Bracelet for my Husband. Not many Bracelets Suitable for a Man. We have had comments by his Physicians when he didn't wear it, "Where's that Awesome Bracelet your Wife bought You! If it were mine, I wouldn't ever take it off! It's obvious that she has Class in her Purchases!" Now he Makes certain he's wearing his bracelet when he goes to the Dr! My husband knows his Gemstones, as we have collected several. Being Native American, Elderly and Disabled, it's not an Easy Task finding good Quality. He likes it very much. 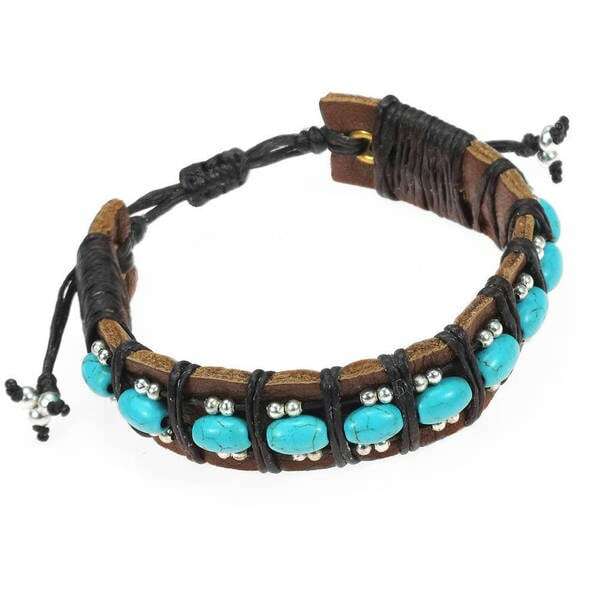 A charming addition to your outfit, this bracelet features an array of turquoise rolls withe silver glass beads accent. Crafted by hand, this bracelet offers adjustable genuine leather band for a custom fit. "My name is Tor. I began making jewelry as a hobby and soon realized that it was my true calling. I saved up as much money as I could until I had built up enough capital to open my own store. With hard work and patience, I now have a few employees whom I have taught my designs and they help me fulfill customer orders. I enjoy coming up with new designs and working with my customers to make beautiful and original jewelry." All weights and measurements are approximate and may vary slightly from the listed information. Treatment code D (reconstructed turquoise). See Treatment Guide for further information. Love the design! The bracelet looks good, but gave it 4 stars because the adjustable pull losens up while wearing. 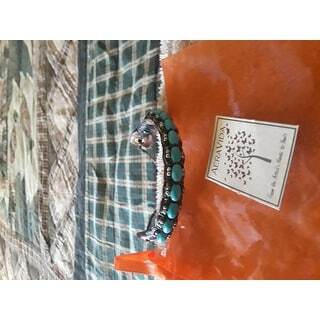 this bracelet comes in brown cord, turquoise stones, and silver beads. very durable and made with leather. it is easy to put on with a string closure. I wear it everyday and it looks great. Bought this nice turquoise bracelet that was hand made in Thailand. It's very attractive and eye appealing. All materials are from natural sources and has great craftsmanship built by a native hand. The pull cord to adjust is a little tricky but you can pull it with your teeth to tighten up or have someone assist. My wife likes it and thinks it's very unique. Happy I purchased it!! The craftsmanship is wonderful on this bracelet. 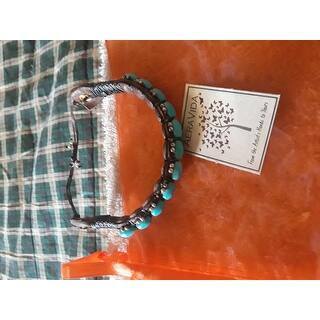 Turquoise beads are settled in snug and won't come out, leather is of good quality. I believe anyone would like this even a male. This is so cute, and a great addition to my collection. I lost my first due to the button closure. I was happy to see this was a string closure. It's not cheap looking, but rather genuine turquoise looking stones. I couldn't be more pleased with this braclets. Bought this for a birthday gift for a friend. She loved it, and loved the fact that it was handcrafted. The bracelet is adjustable to fit all size wrists. Very nice product. Like this bracelet Allot. Nice stones, good color. Big fan of ovetstock. I’m absolutely in love would be an understatement!!! If your even considering ordering this bracelet , order it !!!! It WONT disappoint you!!! The quality is amazing and the skill in the artwork of beading is extreme talent !! I will be ordering more !! My husband loves it ! Just got this in the mail today and it's AWESOME!! Looks great on, is easy to loosen or tighten while wearing and it smells amazing. This bracelet looks handmade and is delicate yet sturdy. At first I was concerned that it would be easy to break while adjusting it, but not at all. Really well made. I love it, but wish it was black leather. It fits good. I've gotten a lot of compliments on it. I would recommend it to a friend. Solid piece. Very stylish. Well made and pretty! I love handmade jewelry because each piece is ultimately different. DON'T HAVE ONE WANTED BRACELET HOPE IT FITS. WHAT IS RETRY POLICY?